Before using DART Range, it must be calibrated. This is a quick process that aligns DART’s camera with a projector so that shots can be accurately tracked. Some DART systems are equipped with an optional wide-angle lens designed to match the optics of a short throw projector. This allows you to place the DART system and projector close to a wall or screen and still enjoy a large projected image. The setup procedure is almost identical to a normal DART system; however, there are a few things to keep in mind that are unique to a short throw system. Position the projector so that it projects an image approximately 6 feet wide and 4 feet tall. For a short throw projector, this will be 3-4 feet away from the wall or screen. Ideally, the projected image should be large enough to display targets that are actual size. If you are using a regular projector without the short throw option, refer to the Calibration Guide for more information. Adjust the focus of the projector as needed. Position the DART system directly behind the projector approximately 6 feet from the wall or screen. For best results, extend the neck and legs of the DART tripod to their maximum length. Before proceeding with calibration, make sure the room lights have been dimmed. DART does not require a dark room; however, for best results, it should be free of sunlight and bright room lights. The DART system and projector should be connected and powered on. If not, refer to the Hardware Setup section before proceeding. Make sure that no lens filters are being used for this portion of the calibration process. Run the DART Range software and click the menu icon. Click the Setup menu button. You will see the following options: Calibration, Target Scale, Light Filter, and Weapon Options. Click the Calibration button. The projected image will turn white and display a “picture-in-a-picture” window in the center. Position DART so that it completely captures the entire projected image. 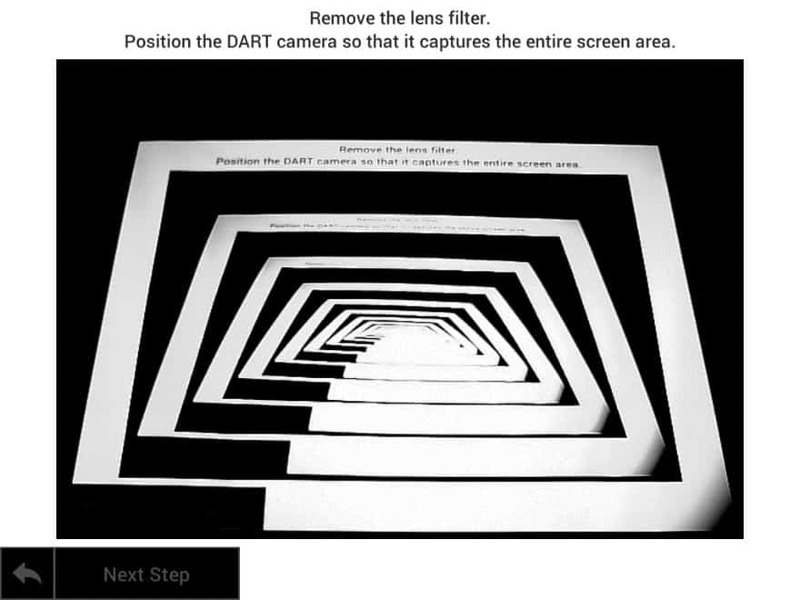 This image below shows the CORRECT way to align a DART system with a wide-angle lens. Notice that the captured image is aligned to the top of the screen and there is a little black space above it. 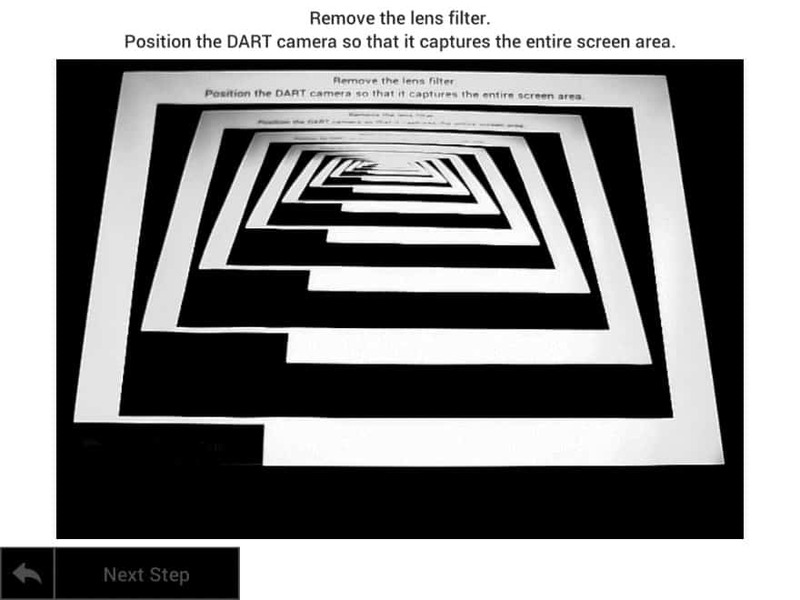 The image below shows an INCORRECT way to align a DART system with a wide-angle lens. Notice that when the captured image is aligned to the bottom of the screen, the corners of the image begin to fade to black. This will prevent the system from calibrating properly. Once DART is positioned correctly, tighten the tripod head and click the Next Step button to continue. The screen should display five white circles and a green rectangle in the middle of the screen. If the program has difficulty drawing the rectangle, it probably means that something is obstructing the view of the camera or projector, or that the system is detecting areas on the screen which are brighter than the calibration circles. This can happen if the camera sees areas of bright light like an open window or light bulb. If you do not see the rectangle, refer to the Troubleshooting section. Once you see the rectangle, click the Accept Calibration button to move to the next step. The program will display a series of small white dots, one at a time. As soon as the program recognizes the dot, it will draw a small green calibration cross (this will happen almost instantaneously). Once you see the green cross, click the Accept Calibration button to advance to the next dot. Repeat this process for all five white dots. Once all dots have been detected calibration is complete. Install one of the lens filters that came with your DART system. If you are using a training weapon with a visible laser, use the red filter. If you are using an invisible laser, use the black (very dark red) filter. Drop the filter into the slot in the front of the DART system. Once the proper filter is in place, you are ready to move to the next step. Click the Target Scale button and use the Screen Size slider to adjust the size of the orange measurement graphic so that it is approximately one-foot wide when projected on the screen or wall. Note: If you must use a Target Scale setting of less than 50, your projector may be too far away from the screen and creating an image that is too large. Generally, your projected image should be 4-6 feet tall. Use the Firing Line Distance slider to set the approximate distance (in feet) between the shooter and the screen or wall. When using a normal projector this should be 10-12 feet. Click the Light Filter button to test the calibration settings. Test fire your laser weapon at the target. The program should accurately track your shots. If not, you may need to run the calibration again or adjust the site alignment of your laser weapon. If you feel the alignment of your laser weapon is off, refer to the Weapon Options Menu section for information on adjusting the aim of training weapons. The Luminance Clamp slider sets a threshold for laser detection. For example, if it is set to 170, anything on the screen with a brightness higher than 170 will be treated as a shot. The Luminance Clamp has a “ghost” handle which cannot be adjusted. It displays the value of the brightest area of your screen. Once the filter has been installed, and depending on room light, the ghost handle should have a value of less than 50 (under 10 is ideal). Since laser light typically registers between 225 and 250, setting the slider value to 200 (the default value) should be low enough to capture the laser and high enough to ignore projector and ambient room light. When you are satisfied with the calibration, click the back-arrow icon to return to the main menu. You should not need to calibrate the system again unless the DART computer or the projector are moved. Once the system has been calibrated, you are ready to load and run courses. Refer to the DART Range Introduction section for more information.